Justice William Stokes declares mistrial after polling jury in the trial of Timothy Danforth, accused of slaying Michael Reis with a shotgun. 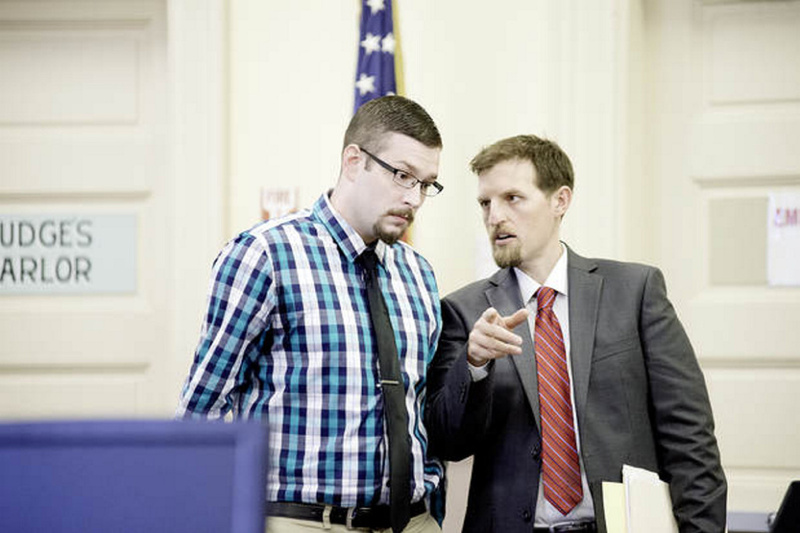 FARMINGTON — Justice William Stokes declared a mistrial Monday in the murder trial of Timothy Danforth of Farmington after jurors stated they were deadlocked and could not reach a unanimous verdict. The six-day trial concluded after Stokes asked each juror if they were at an impasse. Danforth, 25, formerly of Wilton, is accused of shooting Michael Reis, 24, of New Sharon, three times with a shotgun at the home of Robert Danforth, Timothy Danforth’s father, on June 1, 2016. A bag of marijuana and a $200 debt owed to Robert Danforth by Zachary Uhlman, then 18, of Wilton set off a barrage of texts on May 31 that ended in a deadly confrontation at 259 Weld Road in Wilton. Assistant Attorney General Robert “Bud” Ellis said a second trial is unlikely this year because of court scheduling and attorneys. Reis’ mother and family members said “no comment” as they left the courthouse. Defense co-counsel Sarah Glynn and Jeffrey Wilson were also disappointed with the outcome but thought the jury did a great job and listened to their case, Wilson said. “We would have preferred a straight not guilty,” Glynn said. Danforth and his family members had “no comment” as they waited in the hallway after the jury was dismissed. Danforth remains free on bail and supervised release, she said. It is now up to the state prosecutor to decide whether to pursue a second trial, Glynn said. She agreed it was unlikely to happen this year. There is no statute of limitations on murder charges. The trial started Sept. 25 and testimony finished Thursday afternoon. Prosecution and defense provided closing arguments Friday before the jury started deliberations around 1 p.m. They recessed for the weekend about 5:30 p.m. Friday. Restarting deliberations around 8:30 a.m. Monday, the jury sent a note to Stokes at 11 a.m. saying they were at an impasse and wanted further instructions. Stokes told them the time they had taken showed they were doing their job right. The amount of time was not unusual for this type of case. He encouraged them to go back and keep talking until they could reach an unanimous verdict. After breaking for lunch at 12:30 p.m., the jury deliberated for about another hour before sending another note saying nothing had changed. The 12 jurors were charged with deliberating whether Danforth was guilty of murder, and if not, whether he was guilty of manslaughter, self-defense or defense of premises. Danforth pleaded not guilty to the murder charge in August 2016. A murder conviction is punishable by a sentence of between 25 years and life, Stokes had said. The state had made an offer to Danforth for a lesser charge of manslaughter prior to setting the trial, he said.